Yoga, the signature of India’s unbroken spiritual legacy is meant for all and sundry. The enlightening philosophy and practice of yogic tenets do not disbar on grounds of age, gender, or experience level. Given that you receive a systematic guidance and are predisposed to maintain a dedicated practice, the promised benefits of the discipline will come to you. For starters, you can enroll in daily yoga classes in Delhi. 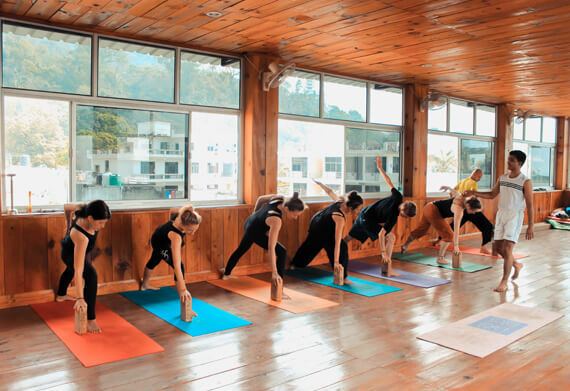 In comparison to the more intensive months-long commitment to yoga and ancillary wellness discipline- the yoga teacher training and daily yoga classes are more convenient at many levels. Classes are available near you, you can continue or discontinue according to your convenience, its financially more affordable, and most importantly, hourly yoga in Delhi will claim a lot less time from your daily schedule. While you should always keep a Yoga Teacher Training on your bucket list, you can wait for a perfect time for that to happen in your life. Till then daily yoga classes should work for maintaining a firm practice, correction and alignment by experienced instructors, an orientation to yogic wellness, meditation, and initiation into the very profound philosophies. 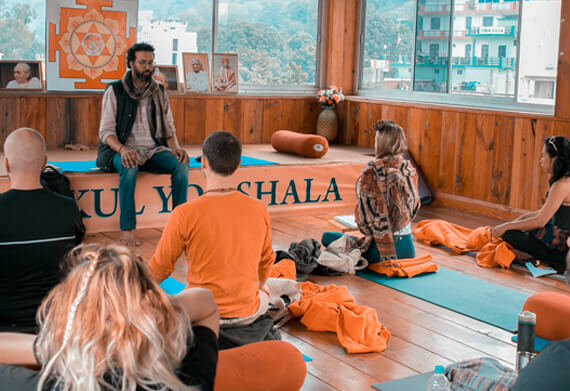 Rishikul Yogshala is listed among the best yoga studios in Delhi to provide a well-rounded training within the format of daily and hourly yoga course. A lot of genuine yoga enthusiasts find their personal journey of yoga at a standstill as other priorities of life start demanding a great deal of time and energy. Between daily chores, office, and relationships, somehow we fail to designate time just for ourselves and that has its own detrimental repercussions in the long run. In this context, daily yoga classes make way for small, rejuvenating sojourns with yoga, meditation, and a much-longed-for quality time. Take this course to self-assess and restore the lost balance to your demeanor. By timing them in the morning for an energy-boost and strength training, start each day fresh and full of high spirits and come back for a restorative session in the evening. Attending yoga classes with an undertone of philosophy and yogic moral-ethics will help you fall back upon the life-affirming principles when everyday psychological challenges tend to weigh you down. As testified widely, a daily practice of yoga-meditation helps cope with changes, curtail unwholesome urges, and boosts the happy hormones. Urban professionals report extensive improvement with yoga classes in Delhi in culturing necessary soft skills like patience, problem-solving, decisiveness, time-management, conflict resolution, teamwork, and leadership, helping them to ascend the ladder of professional improvement faster than expected. Lastly, starting a committed practice at a yoga centre in Delhi can only be the beginning. With worldwide recognition of yoga as an effective discipline of wellness and healing, you can make it big as a ‘yoga entrepreneur’, highly lucrative but a meaningful career nevertheless. The next steps being a yoga teacher training with a reputed Yoga Alliance approved institute. 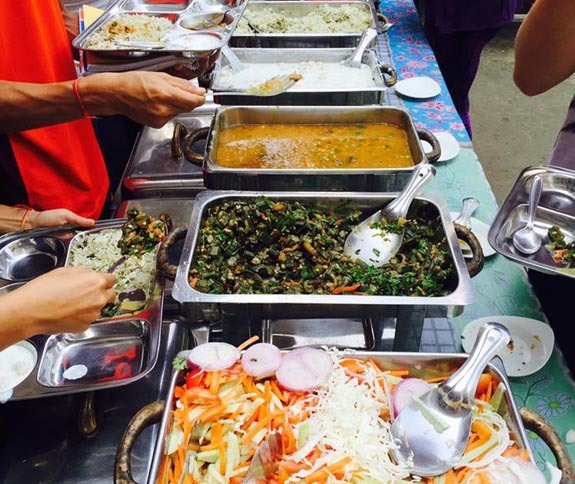 Being the best yoga institute in Delhi, Rishikul Yogshala leaves no stone unturned. A living lineage, the Ashtanga Yoga style dates back five thousand years ago. Its unbroken legacy of the eight-fold or Ashtanga path culminates in the works and teachings of Sri Pattabhi Jois who later codified Ashtanga Yoga as we know it today. Renowned for its exacting levels of challenge in the performance of posture, unique integration of breath, and the characteristic vinyasa or flow style movements, Ashtanga is a popular choice for those who want a hard-hitting, impactful experience of yoga. Our yoga studio in Delhi presents Ashtanga Yoga classes with a touch of tradition and to the satisfaction of those who love an intensive practice. Expect an increasing emphasis on the breath or prana and its regulation as the classes’ progress, and advancing in the vinyasa or flow-style posture performance that utilizes the integration of breath and movement. Hatha Yoga literally translates as the physical movement system characterized by ‘force’, whereas the spiritual interpretation of the word Hatha denotes the coming together of the Sun and the Moon, representing a congress of different energies. This ennobling practice is meant to uplift the spiritual practitioner for higher possibilities or the supreme consciousness. The movement style is slow and contemplative with great awareness of breath. Meditative inquiry too is an integral part of Hatha Yoga. 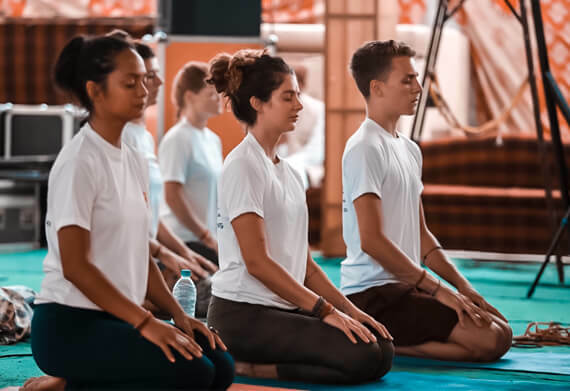 At our Yoga Institute in Delhi, you will be introduced in the beginner, intermediate, and advanced series of Hatha Yoga, the training completes with hands-on assistance and correction of postures and an initiation into meditation. A substantial study of yoga history and philosophy is imperative in the learning of the art if you want to take the discipline beyond the designated hours on the mat. The thousands of years old science of mind-body discipline has gone through many evolutions and different interpretations to become the global fitness statement that it is today. 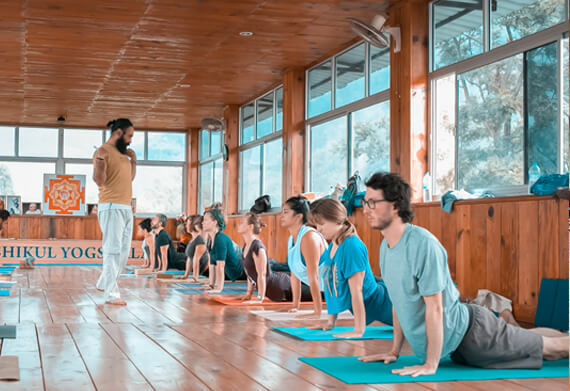 However, with our daily yoga classes in Delhi, you now have a chance to explore yogic philosophical underpinnings with an extensive study of its seminal texts. The Yoga Sutras of Patanjali, Hatha Yoga Pradipika, Hatha Ratnavali, Siva Samhita and others from the ancient canon and the works of 20th-21st century yoga luminaries like Pattabhi Jois’ Yoga Mala and B.K.S. Iyengar’s Light On Yoga form the main body of selected readings which will be studied, discussed, and commented upon during the course. Know yoga at the core, or nothing! ‘Yogas Chitta Vritti Nirodha’ defines the great sage Patanjali, the ancient promulgator of the yoga discipline. This often-quoted statement means Yoga is the removing of the mind’s fluctuations, yoga is stilling of the mind until there is only tranquility because one must experience life as it is, shorn of its many illusions. Meditation is the system to follow in order to see life through the clearest of lenses. Apart from the physical discipline that yoga encompasses, we have the meditative discipline for restoring the mind’s stability. 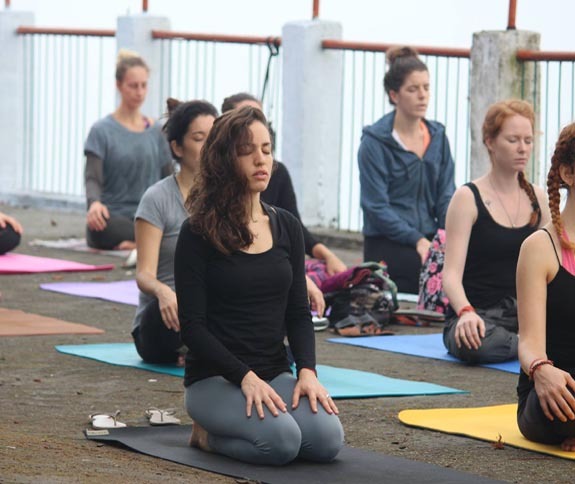 Our yoga classes in Delhi present the opportunity to systematically learn effective meditation techniques such as—Yoga Nidra, Chakra Meditation, Osho Meditation or Dance Meditation, Trataka, Visualization, and various other ways, welcoming the participants in a world of contentment and inner bliss. Apart from the above-mentioned classes, we also conduct special sessions on specific subjects related to yoga and holistic wellness. Laughter yoga therapy for culturing inner joy, and more. We notify our yoga community about these exclusive classes through our social media portals when they are programmed. In case you want a customized class, send us the specification of your group. We need a minimum of five members to conduct a customized class. For more information, call or drop by at the front desk.